CAMBRIDGE, Mass. - Aug. 31, 2017 - PRLog -- MIT returns to Brisbane, Australia with a new step forward, working on innovation for a more sustainable future, with a focus focused on technology-enabled sustainability with a focus on the environment, agriculture, and mining sectors. 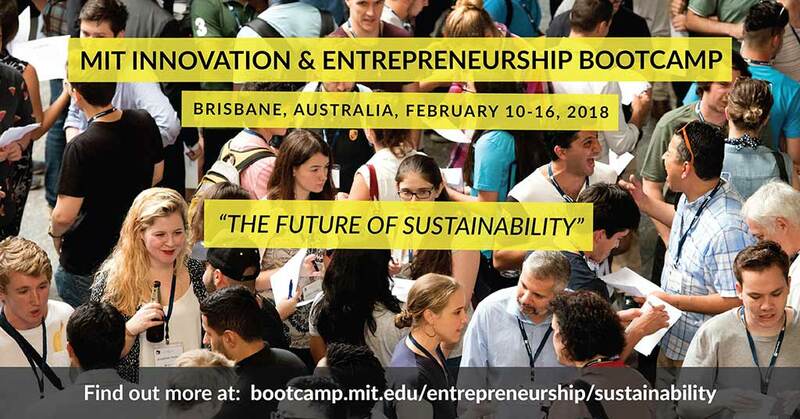 In February 2018, MIT Bootcamps will return to Brisbane to offer its first MIT Innovation & Entrepreneurship Bootcamp on technology-enabled sustainability, with a focus on the environment, agriculture, and mining. We will bring together 60-90 innovators from across the world to focus on global challenges of strategic importance to the State of Queensland. Admission to MIT Bootcamps is highly selective and based on the following criteria: initiative and follow through, open and critical thinking, capacity for calculated risk, and focus on community. Bootcampers have found cofounders and launched startups from the Bootcamps; from the first four courses (2014 to 2016), they have raised over USD $37m in funding for their ventures. In March 2017, MIT Bootcamps brought together 118 innovators from 35 countries (including 38 from Australia) to Brisbane for the fifth MIT Global Entrepreneurship Bootcamp in March 2017..